The CMU Catholic Newman Club is the Catholic student fellowship at Carnegie Mellon University. Meet us for Grace Point Average (GPA) every other Thursday from 7:30PM until 9:00PM in Doherty 1212! 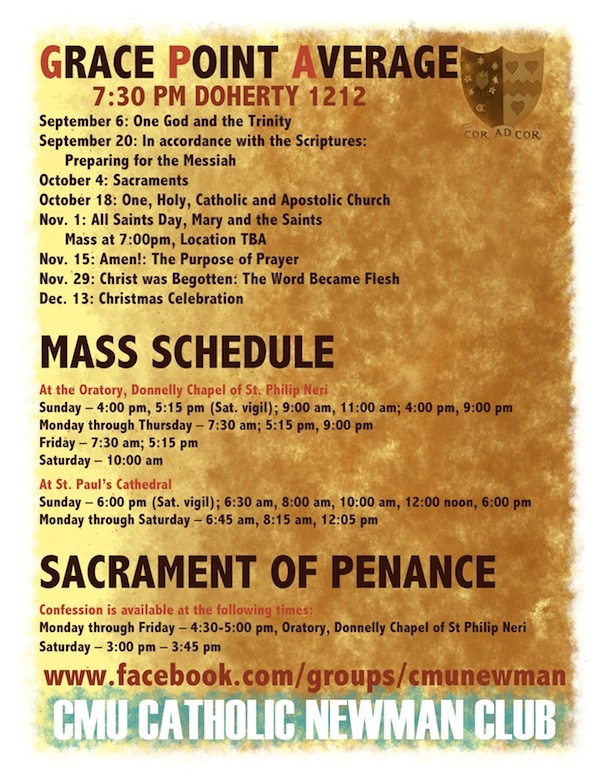 We decided to bring back CMU's Catholic Newman Club large group meetings! The purpose for these meetings is to learn about our Church and to dive into its beauty and history together as one large Christ-centered community and support network. GPA is what we choose to call these events. As CMU students, we work towards a good GPA, but is that all we should be working for? Email Christine if you want to help lead any prayers, or if you have an idea for how there could be more praying together!